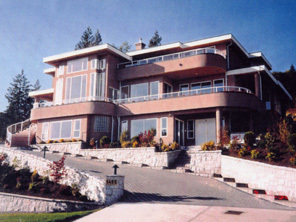 by William Edward Summers, Inc.
Modern Home, West Vancouver, B.C. Provide design consulting for a house on a narrow hillside lot overlooking the city of Vancouver, B.C. Move your mouse over the icons below to see larger views! Design a modern house nestled into the hillside with balconies and windows to capture the spectacular views of Vancouver. ©2004-2006 William Edward Summers, Inc.